The doctor pointed his finger at one of the newborn twin girls and told Angie Garber’s parents, “That one won’t live.” With complications from the multiple birth, he saw little hope for Frank and Emma Garber’s youngest of nine children. Not only did Garber live, but she spent most of her 94 years serving others. Although her left hand became permanently crippled from polio when she was 19, it did not stop her from caring for her sick mother for the next 10 years. Following her mother’s death, Garber attended and graduated from Bryan College, spent a year at Wheaton College, and then graduated from Grace Theological Seminary in 1951 with a master’s degree in religious education. When she was 38, Garber was asked to teach at the Brethren Navajo Boarding School in Counselor, New Mexico, by Grace Brethren Home Missions. She agreed, submerging herself in the Navajo culture and serving the people. Her roles included teacher, dorm supervisor, and cook, but she also worked at summer camps, started a radio ministry and visited the Navajo people in their homes. Bill Hybels and Rob Wilkins, in their book Descending into Greatness, report on a day spent with Garber when she was 80, providing a snapshot of where she lived and what her ministry at the reservation looked like. It was a tiny off-white house with three rooms, isolated from civilization, that Garber called home for more than half her lifetime. However, as she drove through the desert on her day with the book’s author, she sang, “This world is not my home.” Awaiting her home in heaven, it didn’t matter that a single bed barely fit in her bedroom or that she didn’t have room for a couch in her living room/kitchen. “I don’t want to just have things,” Garber said. “When you love things, you use people.” Love for people was never a “thing” that Garber lacked. Visiting a lonely, widowed Navajo woman that day, she refused to let mud blocking the road stand in her way. The love between the two women was visible when they arrived at the woman’s home and she ran to greet Garber with a hug. It took Garber a little time at first to appreciate where God had called her. She said, “When I first came here to serve, I thought this was the most desolate place in the world. I called it a desert.” She eventually came to view the reservation as an oasis. Every day, Garber ministered to and befriended people who are easily misunderstood because of cultural differences. But perhaps part of the answer for the Navajo people’s complexity lies in their land – the land where they have lived for centuries. Below the desert’s surface, there are ancestral tombs and a sense of mystery. Despite the fact that little is available on the reservation, many refuse to leave. To them, the land is more than just something they can call their own; it is sacred. Not surprisingly, the Navajos live among paradoxes: the importance of history and need for a future, pride and poor circumstances, independence and subjection. Caught between the reservation and the outside world, they have become exposed to drugs and cults. Drinking and drug use are very high. In such a situation, it is hard to know the truth. “I don’t think anyone really knows how many genuine converts there are,” said Garber. The number of lives with visible change through Jesus has been few. “The issue is not how many people come to know the Lord or not; the main thing is: Is your heart for the Lord? If you didn’t love the Lord, you couldn’t work or serve here,” explained Garber. For her, love was everything. It had to be unconditional, and it often came from sharing life with the people around her. The last stop on the day with Angie was to see an elderly man named Ben. Only a few years before, Ben had become a Christian after doing time in prison for killing his wife. Garber paused from reading her Navajo Bible to ask Ben if he’d ever thought about what it meant for Jesus to come down and show His love for us. Ben nodded. “I can’t understand that kind of love,” he said. 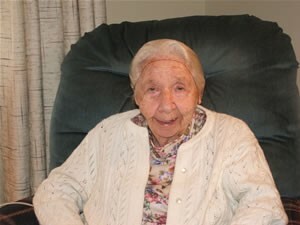 Garber quietly went to be with her Lord on October 14, 2006, at her home in Westerville, Ohio. But her legacy lives on among the Navajo people she touched. Katy Devereaux, a Grace College English major from Jackson, Michigan, was an editorial intern with BMH during the fall of 2006. Just wanted to say I have been telling the mission story of Angie to the Good News Club at Rescue School in CA. We have all been fascinated to learn of her life and her love for all people. I appreciate the added information found in your article as well as the picture. Thank you and God bless you. I knew here from the year I spent teaching at the Grace Brethren Navajo Mission. I was there in my early 20's as a short term missionary. Angie Garber was a fantastic woman of God who unconditionally loved people! It was great to see the love of Christ in action with great humility and joy!